Neyland 1st X1 entertained Saundersfoot in the first round of the Pembrokeshire League Senior Cup at the Athletic Ground on what turned out to be a relatively fine and sunny autumn afternoon. The home side began as they intended to continue by playing offensive football creating chances from the flanks and through the middle. However it took around 25 minutes before any of the ever-increasing chances were converted when midfielder Nathan Warlow latched on to the ball and struck one of his trade-mark shots to beat the visitor’s diving keeper. And the supporters did not have long to wait before Warlow notched up his second tomgivemthe homester’s some breathing space and encourage further forays. Before the interval captain, Sean Hannon was in the right place to head home a third for the Nomads. After the break Neyland continued to apply constant pressure on the visitor’s defence but, with the exception of a disallowed goal for offside, the home side had to settle for a 3-0 victory and look forward to the next round the draw for which should be made this coming week. Meanwhile the 2nd X1 won away to Milford Athletic by a similar margin – 4 – 1 with goals coming from Andrew Smith 2, Phil Bevan and a Mike Chandler strike which deflected from team mate Joe Charlton. This win cements their position of 3rd in the division. Nice to see Ollie Marshall back with the club having been relocated to Brawdy from his previous army base in Bristol. Equally good to see the return of Joe Charlton after his 13 stay in New Zealand. 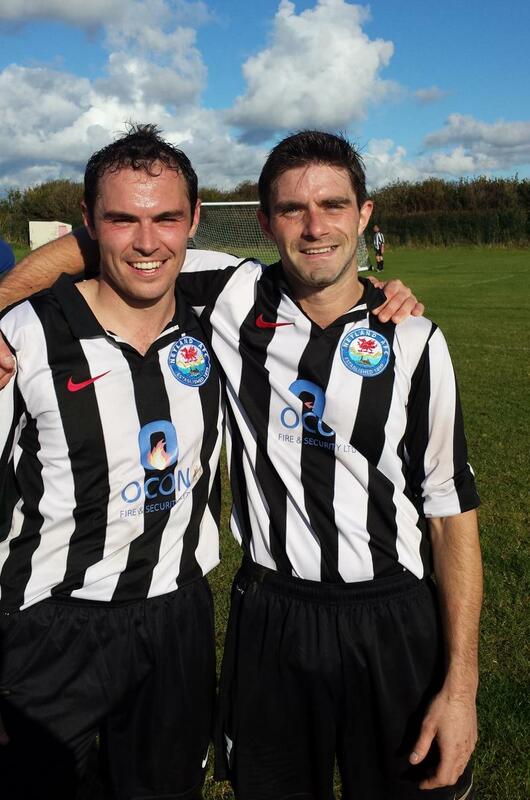 Photographed below are 1st team scorers Sean Hannon (left) and Nathan Warlow! Sean Hannon (left) and Nathan Warlow! This entry was posted in Sports on October 16, 2014 by admin.